For a quick-and-dirty, intro-level audio upgrade, this sound bar offers no-frills 5.1 sound at a very attractive price. Vizio has always been a practical, consumer-driven company focused on delivering high value at the lower end of the market. Its S3851W sound bar lives up to that legacy, offering excellent value and true 5.1 surround sound in an easy to set up package priced at just $279 (about £171, AU$312). The whole reason sound bars exist is to do one (or more) of three things: save space, save money and/or make setup easy. For the ease of setup, many sound bars offer so-called "virtual surround," a technique that uses multiple drivers in the front unit to bounce sound off the walls and ceiling to create the illusion of rear speakers without having to run wires or do any mounting. Vizio, however, takes a different approach with the S3851W. The unit houses conventional left, center and right channels in the front unit, then wirelessly pairs to a powered subwoofer in the back of the room that drives two rear speakers that wire directly in to it. I like the honesty and simplicity of this approach. High end virtual surround sound bars (particularly those from Yamaha, the company that pioneered virtual surround) can work very well, because they employ sophisticated DSP technology to compensate for different room configurations. But at the low end, there's a good chance they're faking it, hoping the bargain price distracts you from the lack of rear definition. Vizio makes a great call with the S3851W by putting an actual, physical set of speakers behind you. The wiring problem is partially solved by pairing the front unit, which is wired to your input source, with the subwoofer – designed to be placed in the back of the room, then wiring the rear speakers from the sub. It's a solution that delivers true surround sound for just $279. There's the small matter of finding good places to put those rear speakers, but it's a small price to pay for such an effective solution. Still, you can't get caviar for the price of pretzels. 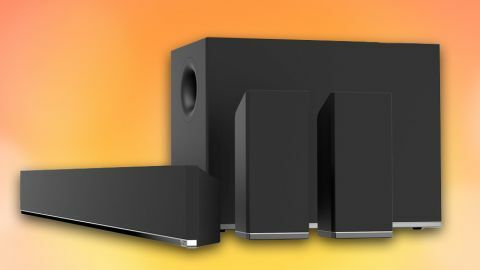 While this setup is a serious upgrade from your TV's built-in audio, it does have limitations, the first being overall power. This package is fine for a smallish setup, but don't expect it to fill an enormous room. But for modest home theater use, Vizio delivers plenty of performance for most non-audiophiles. Speaking of which, while the system does a only competent job with music and should be viewed as a stereo of convenience, rather than one that provides a true high fidelity experience. One of the joys of the sound bar approach is the simplicity of the setup. Here is all it took for me to get 5.1 sound working: 1) Plug the front sound bar into a power outlet and attach to my TV's optical out. 2) Plug in the subwoofer. 3) Attach the rear speakers to the subwoofer via included wires (one wire per speaker, RCA to RCA). 4) Turn it on. That was it. I had the S3851W pumping out 5.1 sound in under 5 minutes. Of course if you're installing this system permanently, you're going to want to spend some time figuring out the optimal placement for your rear speakers. Mounting them to the wall will cost you a little drill time and you'll want to figure out a good solution for the wires between the sub and the rears – at 25 feet, they're long enough to give you a lot of placement flexibility – but in terms of basic functionality, the setup couldn't be simpler. The wireless auto-pairing between the sound bar and subwoofer worked instantly and flawlessly. After weeks of use, I never experienced any hassle with it. The included remote allows you to adjust the sound bar's basic functions. You can pan sound to the left or right, adjust the levels for the rear speakers and subwoofer as well as the audio delay (to make sure audio is in sync with what's happening onscreen). The helpful Speaker Test function calls out each speaker in turn to make sure everything is functioning correctly and placed in the proper location. One nice touch is the panoply of connection cables Vizio ships with the system, including an optical cable, RCA cables, and a coaxial cable. Note: the system does not have an HDMI input, which would have been nice, but not necessarily expected at this price point. Sized for screens 42 inches and larger, the black, unassuming S3851W won't win any design awards, but neither is it ugly. There's a good chance it will just fade away under your screen, and that's just fine. The small remote is simple and intuitive, with a helpful LCD screen that lets you know what part of the sound bar you're manipulating at any given time. Small LED lights on the front unit provide helpful visual feedback of the adjustments you're making. The subwoofer is meant to be heard and not seen, and as such is an unremarkable black block with a power switch and three jacks (power and the two rear speaker inputs). The rear speakers are small and light and feature mounting screws on the back for wall brackets or stands. They feel a little cheap, but they get the job done just fine.